Coaching. At times it can be like parenting, at other times it is like being best friends, but the key to a successful player and coach relationship is succeeding at the fine line between the two. A coach has to know when to a) push a player and b) when to laugh and be supportive. When the relationship is built in this manner, trust exists; and that leads to a bond, a friendship and a desired level of success. Kerri Walsh Jennings said, "Adversity, if you allow it to, will fortify you and make you the best you can be". 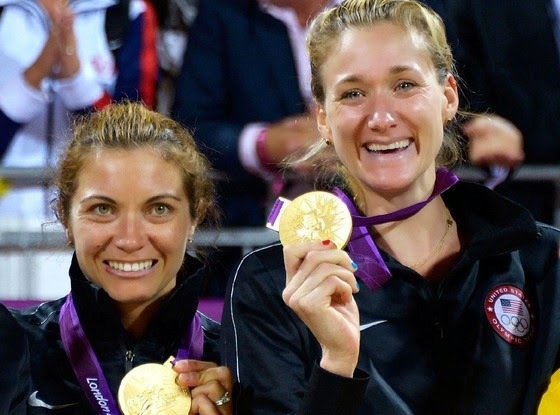 When you play at an Olympic level for over a decade, a coach being over your shoulder is not always necessary, but the process, friendship & ability Kerri and Misty May shared over the years is something all volleyball players can learn from. c.) and understanding you have with your teammate(s). Understanding positions, placement and predicting behavior before the ball comes over the net are keys to success. When all these characteristics come together, with a coach who acts as a successful mentor and "manager" of the game, the sky is the limit. Just as it was May-Treanor and Walsh Jennings. As a coach, there are times to be tough and there are times to be supportive. Understand the personality of your players and the times they need motivation and the times they need support, because when you can walk this line, you will be a friend and a mentor, not just "Coach X". Leadership- Know when to lead and how to adapt. Adaptation is the key to success. Knowledge Obviously this is key. But more than just knowledge of a game, you have to understand your personality, your players' personalities and how they work together to reach a goal. Charisma- Have an appeal and a manner that is always what your players are looking for. Be a tough coach when necessary, but be a supportive friend when needed. Walking this line can only bring you and your team closer. As a teammate, remember three tips to assist you and your team in succeeding and reaching desired success. Rather on the court or off, be on the same page. Understand each others tendencies and needs to where you can predict behavior and act as a cohesive unit on the court or in the sand. Hard work- Every athlete should work hard. Rather you are Misty May or playing the game for the first time, hard work and determination will assist you as a player, but more than anything, help you gain the respect of your peers and lead to them working at the same level. Have fun, be determined- As athletes, we all know that the term "it's just a game", usually does not hit home. If it was, what would be the point of practicing hard and having a true drive for competition? But what is vital, is to understand the need to smile, have fun and still be determined to a point where your team is not just close in a match, but they are a family each day of every week. Click here to Join Team Connection's TC Club today. It is free, and offers incredible deals on name brand apparel and accessories and includes exclusive content, such as this. -Brad Gaither, Team Connection Inc.